Plannerisms: Daycraft Executive diary review and giveaway! Here is the first of three Daycraft giveaways! This weekly planner/ diary is from the Executive range. 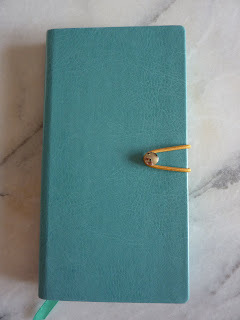 This diary is the slim Pocket size, measuring approx. 6 1/2 inches tall and 3 1/2 inches wide. The Executive diaries also come in a smaller Mini size (weekly), slightly larger A6 size (day per page) or for people who need a lot of space for each day, a day-per-page A5 size. 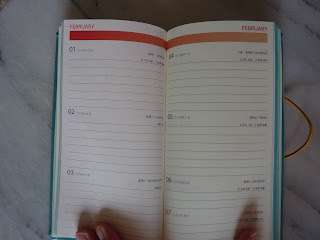 Each of these formats and sizes comes in blue (like this diary), pink, light brown, or black. The first thing I noticed about the Executive diary is that it is entirely classy inside and out. It's a great-looking book, very professional yet stylish. There are some exterior details that really make this book stand out. 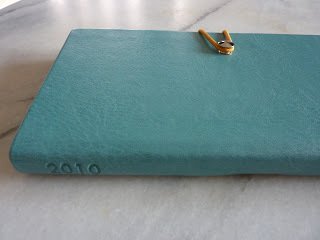 The cover is leather-like and pleasant to touch and hold. On the spine is embossed 2010. 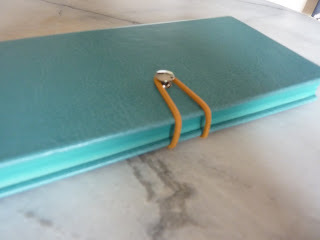 The contrast-colored elastic cord loops around a metal stud to hold the book closed securely. The page edges are colored blue, and there is a matching blue ribbon placemarker. 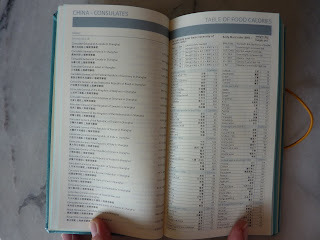 Inside, the book is absolutely packed with features. This particular book is geared toward people living in Hong Kong or China, and would be extremely useful for anyone living there or traveling there. There are pages of holidays, airline phone numbers and websites, hotels, important and useful telephone numbers, area codes, consulates, etc. for both Hong Kong and China. 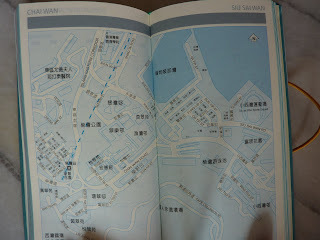 In the back of the book there are several pages of street maps (and you all know how much I love maps!). 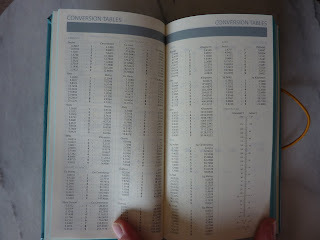 There is also an excellent conversion table which is useful for anyone who needs to convert between US customary units and metric measurements. 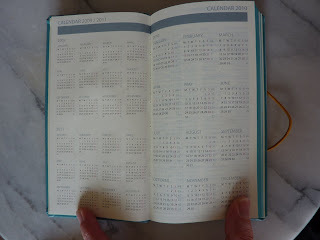 This diary also has several very useful calendars throughout the book. 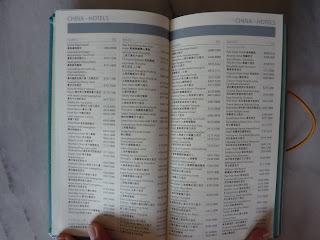 There are overview calendars for 2009-2010-2011. 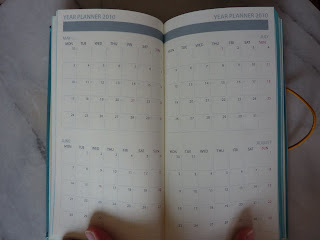 There are also monthly calendars for 2010 and 2011, which are very useful for long-range planning. 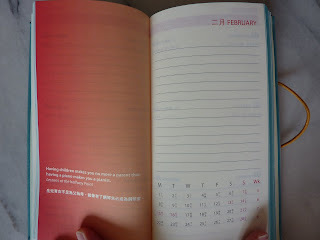 The main part of the diary has a weekly layout with the days and dates in English and Chinese. I have been told that starting next year the Executive diaries will have the US holidays. The daily spaces are lined but not timed, giving you the flexibility to note appointments and tasks. Across the top of the page is a colored bar that is coordinated with the monthly page. Here is a feature that I really love about Daycraft diaries: in the weekly section, at the beginning of each month there is a page spread with a quote on the left page, and on the right page there is the calendar for that month with lined space covering most of the page. I think this is a great idea. This monthly page can be used to write your monthly goals, major events or deadlines for that month, things due (for example, if you have a semi-annual insurance payment due that month, or that's the month you are due for your dental exam), whatever else. I really like having this space each month for lists and notes. 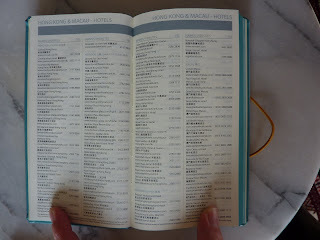 In the very back of the book there is a page for your personal information for easy reference. And there are several pages of perforated tear-out mini notes, for those times when you need to give someone your contact information on the go. Excellent feature! Even if you never go to China or Hong Kong this year, the Executive would be an great diary/planner for the busy person on the go. 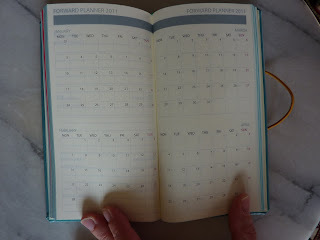 It is an excellent, stylish planner that is slim enough to fit into any purse. So now, the giveaway! As reluctant as I am to part with this beautiful book, I think more people should be able to see the style and quality of Daycraft books. 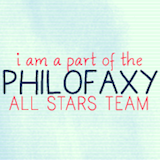 So make a comment to place your entry! Good luck! Found your blog thru the Penaddict. Enjoying every post since. Hope to be the lucky one. I love this planner! The color is beautiful but it also looks very functional. I love the forward planning it includes. Month at a view is so helpful. Awesome review! 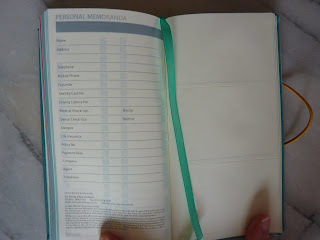 Perhaps this planner can replace my less-then-functioning moleskine. I've been reading your blog with equal parts relief (there's someone else out there as persnickety as I am about planner formats!) and astonishment (wow, you've had more than one planner in play at a time and admit to owning several for the same time period!). Thanks for the giveaway. the metal stud and cord loop makes this a special one. lots of good stuff on the inside. Pretty book. Thanks for the giveaway and the reviews. All of them.